A North Korean mysterious bulk freighter named Jie Shun was flying Cambodian flags and carrying cargo that was heavily shrouded in tarps. Once seized, under those tarps, a cache of weapons was found and the surprising destination of those weapons was uncovered. In August, a secret message was passed from Washington to Cairo warning about a mysterious vessel steaming toward the Suez Canal. According to The Washington Post, that’s all it took for authorities in the United States to act and monitor the Jie Shun. The Jie Shun is listed as a cargo ship on vessel tracker and even though it was flying Cambodian colors, it did originate from North Korea. Customs agents were waiting for the mystery cargo when the ship entered Egyptian waters. They swarmed the vessel and discovered, concealed under bins of iron ore, a cache of more than 30,000 rocket-propelled grenades. This cache was worth about $23 million. But who were all of these weapons for? The Jie Shun’s final secret would take months to resolve and would yield perhaps the biggest surprise of all. The buyers were the Egyptians themselves; longtime US allies. A United Nations investigation uncovered a complex arrangement in which Egyptian business executives ordered millions of dollars worth of North Korean rockets for the country’s military while also taking pains to keep the transaction hidden, according to U.S. officials and Western diplomats familiar with the findings. This discovery also shed a bit more light on a little-understood global arms trade that has become an increasingly vital financial lifeline for North Korean leader Kim Jong Un in the wake of unprecedented economic sanctions. It appears that North Korea and those who support the rogue nation are unconcerned about the ink on paper that makes up the UN sanctions. Even as the United States and its allies pile on the sanctions, Kim continues to quietly reap profits from selling cheap conventional weapons and military hardware to a list of customers and beneficiaries that has at times included Iran, Burma, Cuba, Syria, Eritrea, and at least two terrorist groups, as well as key U.S. allies such as Egypt, analysts said. 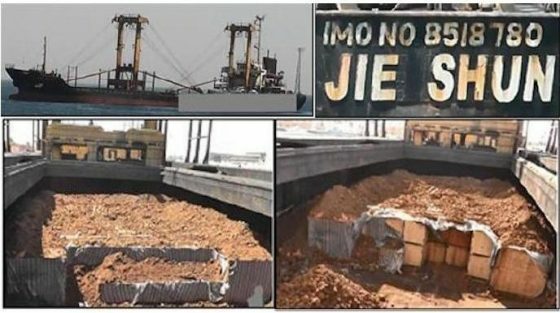 North Korea attempted to hide $23 million in weapons to Egypt under crates of iron ore.
A statement from the Egyptian Embassy in Washington claimed to Egypt is being “transparent” and is in cooperation with U.N. officials in the finding of and destroying the contraband. “Egypt will continue to abide by all Security Council resolutions and will always be in conformity with these resolutions as they restrain military purchases from North Korea,” the statement said. This secret and potential deadly alliance between Egypt and North Korea was disguised quite well. U.S. officials confirmed that the delivery of the rockets was foiled only when U.S. intelligence agencies spotted the vessel and alerted Egyptian authorities through diplomatic channels. This left Egypt with little choice, and essentially forced them to take action against the cargo ship, said current and former U.S. officials and diplomats briefed on the events. The officials, who spoke on the condition of anonymity to discuss U.S. and U.N. findings, said the Jie Shun episode was one of a series of clandestine deals that led the Trump administration to freeze or delay nearly $300 million in military aid to Egypt over the summer. Even the shipper, listed as Dalian Haoda Petroleum Chemical Co., also tried to hide information written on the crates themselves by covering them with large canvas patches. And the Trump administration isn’t playing games with Egypt’s secret allegiance to Kim Jong-Un. According to officials who spoke to The Washington Post on condition of anonymity, the Jie Shun incident is one of many secretive deals behind the Trump administration’s decision over the summer to freeze nearly $300 million in military aid to Egypt. For its part, Egypt claims to be cooperating with U.N.officials in finding and destroying the weapons. A statement the Egyptian Embassy in Washington gave to The Washington Post claims it is following all the rules. Previous Was Las Vegas Shooter Stephen Craig Paddock An Anti-Trump Activist With Ties To Antifa?